If you are missing a number of adjacent teeth, Tooth Implant Sydney can help you with it. Instead of replacing them with individual implants, it is more affordable to join two or more implants together with anchors. When a segment of teeth needs replacing, it is often not necessary to place an implant support under each tooth. Replacing multiple teeth using dental implants gives your teeth a level of feel and functionality that is not possible with other treatment options. Two or more implants can be used as anchors to replace a segment of three or four teeth. If an entire arch needs replacing, a full set of teeth can be supported with the help of four anchors. Implant bridges: Dental implant bridges replace the support lost as a result of missing teeth, and is often done as an alternative to dentures. In this case there is no need to drill the adjacent teeth. There is also no requirement to insert an implant for every missing tooth. The dental specialist will first check whether the space, gum tissue and underlying bone are appropriate enough to place the dental implants. Dental implants are inserted at the right positions to replace the missing teeth. When the multiple teeth implants have healed and are stable enough, abutments or crowns are attached to the implants that will connect the final bridge to the dental implants. An impression is made from the contours of the implant tops. The implant bridge is then fabricated and retained in place using screws. It is very important to maintain oral hygiene and implant restoration should be routinely evaluated. The time interval is dependent upon the conditions of the remaining natural teeth and the implant bridge. Though an implant bridge is not susceptible to cavities, it may develop complications if oral hygiene is not maintained. After the initial examination, you can expect 4-5 additional visits until the final fixed bridge is permanently attached. Multiple dental implants provide several advantages over other teeth replacement options like dentures. In addition to looking and functioning like natural teeth, implant-supported bridges replace teeth without support from adjacent natural teeth. Other common treatments for the loss of several teeth, such as fixed bridges or removable partial dentures, are dependent on support from adjacent teeth. In addition, because implant-supported bridges will replace some of your tooth roots, your bone is better preserved. With a fixed bridge or removable partial denture, the bone that previously surrounded the tooth root may begin to deteriorate. Dental implants integrate with your jawbone, helping to keep the bone healthy and intact. In the long term, implants are aesthetic, functional and comfortable. Gums and bone can recede around a fixed bridge or removable partial denture, leaving a visible defect. Resorbed bone beneath bridges or removable partial dentures can lead to a collapsed, unattractive smile. The cement holding bridges in place can wash out, allowing bacteria to decay teeth that anchor the bridge. In addition, removable partial dentures can move around in the mouth and reduce your ability to eat certain foods. Looking for an experienced multiple teeth implant professional in Sydney for your multiple tooth loss condition? 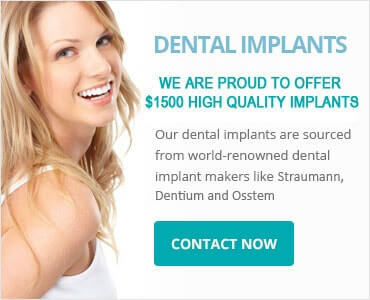 Your search is over with Tooth Implant Sydney. Call 1300 850 072 to book an appointment.